When I learned how to bake chicken breast I did not do it solely for the sake of plain cooking. I found that is not a good idea because the white breast meat is naturally the driest part of the chicken. This is why when baking a whole chicken the technique of upside down cooking is a good process; the fats from the dark meat naturally baste the white meat during cooking. When the only purpose of baking is to the chicken breasts done, other ways of doing it result in better taste meat. When I learned how to bake chicken breast I found a better alternative to be the quick cooking techniques. Quick cooking like frying, grilling over hot fire or broiling will help to seal in the moistness of the chicken rather than drying it out. If you choose to cook a plain breast in the oven, I always add a little water or broth to keep it moist. You can also use the broiler and place it about 6 inches from the heat source. After broiling it about 8 to 10 minutes on one side, turn it over and broil about 5 to 7 minutes on the other side. Make sure it is cooked through but be careful not to overcook; this makes a very succulent chicken breast. Of course, adding your favorite spices before cooking makes it even more flavorful. Now saying all this does not mean you cannot learn how to bake chicken breast recipes which are good. Great recipes can be produced by baking with sauces, liquids and other ingredients; ones which add more moisture to it. We are all familiar with the delicious chicken cordon bleu recipes; made with ham, cheese and sauce combined with the chicken breast. I have never made any of these recipes which were not wonderful and they are baked in the oven. Below are recipes that you can use to learn how to bake chicken breast. Sometimes recipes will start off by baking at a high temperature briefly which will help to seal in the moisture. This is especially true if brushed with an oil based marinade. Learn how to bake chicken breast with a delicious raspberry salsa to turn into a great special dinner entree. With sharp knife cut into thick part of breast and filet to make more even breasts. Combine and blend bread crumbs, parsley, salt and pepper in flat dish. Brush chicken with garlic flavored olive oil; roll in bread crumb mixture. Place chicken in greased 9 X 13 inch baking pan. Bake in preheated oven at 425F degrees for 15 minutes. REDUCE HEAT TO 350F degrees. Pour raspberry salsa over the chicken; sprinkle with cheese. Return to oven about 7 minutes or chicken is done. Learn how to bake chicken breast with green grapes. Some may not think that sounds good but green grape recipes often contain chicken making a delicious combination. When you make chicken salad try adding some grapes; that is also very tasty. Combine ¼ cup flour, celery salt and pepper in bag or dish; coat chicken well with flour mixture. Brown chicken in Dutch oven in hot oil on top of stove. Combine soup, rosemary and tarragon and pour over chicken; bring mixture to boil. Cover Dutch oven and place in oven 40 to 45 minutes or until chicken is tender. Remove chicken from pan to warm platter; gradually stir wine into 1 tablespoon of flour until smooth. Stir wine and flour mixture into pan sauce until hot; stir in the grapes. Serve chicken on bed of hot cooked rice; top with grape glaze. How to bake chicken breast Mexican style. This delicious recipe for chicken Kiev is a Mexican delight. I love the flavors of Mexican spices and chilies; this one has the cumin, chili powder, chilies and creamy cheeses. Cut into thickest part of chicken breasts with sharp knife to filet. Place between 2 pieces of wax paper and pound with meat mallet or rolling pin to ¼ inch thickness. Place chilies and cheese evenly on top of chicken breasts. Roll chicken up starting with short end; secure with wooden picks. Combine breadcrumbs, Parmesan cheese, chili powder, cumin, salt and pepper. Dip chicken rolls in melted butter; dredge in breadcrumb mixture. Place in lightly greased 9 X 13 inch baking pan; cover and chill 8 hours. Bake in preheated oven at 400F degrees for 30 minutes or until chicken is done. Discard wooden picks and serve with salsa. This broiled rosemary chicken has a wonderful fragrance when cooking and wonderful taste after cooking. In addition to the baked chicken breast recipes, I thought you might like to try a quick cook broiled recipe. Cut through the thickest part of the chicken breasts making them even in thickness. Combine honey, melted butter, lime juice, Dijon, rosemary, garlic, savory in a large shallow dish. Sprinkle chicken with salt and pepper; add chicken to marinade turning to coat. Cover and marinate in refrigerator about 2 hours. Spray broiler rack of pan with cooking spray; remove chicken from marinade and place on rack. Place chicken about 6 inches from heat source and broil about 8 minutes. Turn chicken over and broil about 7 minutes longer or until chicken is done. Sprinkle chicken with salt and pepper; place in greased 9 X 13 inch baking pan. 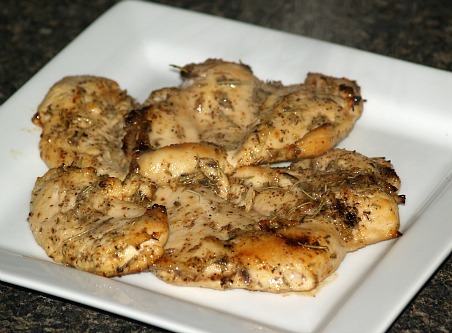 Combine butter and ¼ cup mustard and blend; pour over chicken breasts and top with pecans. Bake uncovered in preheated oven at 375F degrees for 35 minutes or until chicken is done. Remove chicken from pan to serving platter and keep warm. Combine remaining 2 tablespoons mustard, pan drippings and sour cream in saucepan. Cook and stir over medium heat until thoroughly heated; add enough water for desired consistency. Pour sauce over chicken to serve.